The ultimate measures of the successes and shortcomings of our efforts to protect and restore Puget Sound are seen in the condition of the Sound and its biological resources. Environmental indicators serve as one measure of our performance. Consider an analogy to medicine where Puget Sound is the patient and our efforts to protect and restore Puget Sound are the course of treatment. Environmental indicators are the “vital signs” that we use to measure the health of Puget Sound. We use these signs to tell us how the patient, Puget Sound, is doing, and whether our treatments–programs and actions–are working. The environment is continually changing. It is often difficult to determine whether changes observed in environmental indicators reflect natural factors (such as varying ocean conditions) or relate to human actions. Our actions and programs to protect and restore Puget Sound do not always have a simple relationship to environmental results. Multiple programs may interact to bring about changes observed in the environment. Actions taken today may not result in an environmental response for a number of years. The environmental indicators that we track and present in this document offer a simplified view of some of the many aspects of Puget Sound’s health. Selection of a limited number of indicators necessarily limits the breadth and diversity of information that is presented. Converting data to simple indicators can sacrifice some of the richness of the underlying information. 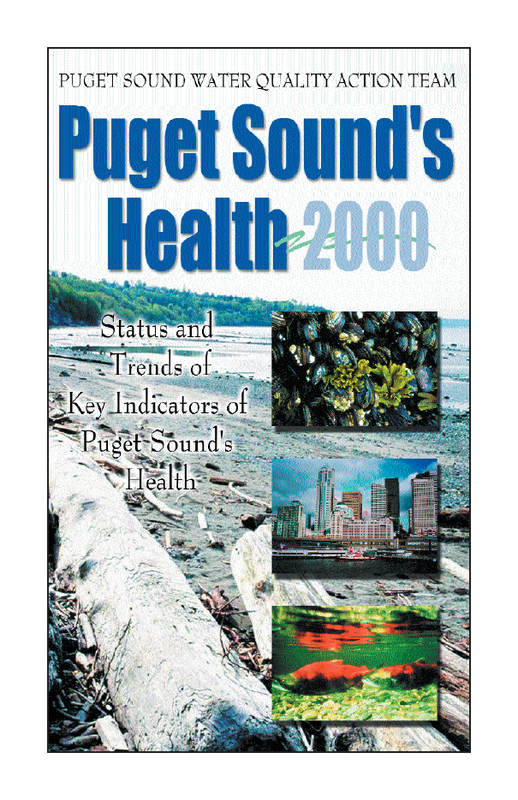 For more information on conditions in Puget Sound, visit the Action Team’s web site or call us (contact information is presented on the inside of the back page) to obtain other publications about the condition of Puget Sound, including the 2000 Puget Sound Update. Despite these difficulties, we are committed to checking Puget Sound’s “vital signs” and using this information to adapt and improve the “treatments” that we offer. An exact diagnosis and prescription is not always possible, but monitoring results often suggest management responses. For example, Puget Sound resource managers might change the requirements of wastewater or stormwater discharge permits based on information about patterns of contamination; fish and wildlife managers might identify selected areas as "no take" zones to protect species in poor condition; or public health agencies might issue advice on consumption of Puget Sound fish and shellfish based on detected levels of contamination. We hope that the environmental indicators presented on the following pages will help you understand Puget Sound’s condition and draw some conclusions about the programs and actions being implemented to protect the Sound. The Puget Sound Water Quality Action Team works with federal, state, tribal and local governments, citizens and businesses to develop and carry out two-year work plans that guide protection of water quality and biological resources.